Kleefeld on Comics: Avast, Ye Scurvy Dogs! Okay, take five pirates. Drop them into 2003 and teach them the basics of life in the 21st century, but not so much that they really "get" it. Then let them loose. Hilarity ensues. I just picked up Andre Boyd and Ryan Yount's Scurvy Dogs collection and I have to say that I'm very sorry I missed this when it first came out. It really is just about pirates who don't quite "get" living in the 21st century. They know about television and corporate America and hummels and copyright laws, but they still just want to be pirates. The book collects all five issues of the original series, which was a mixture of short vinettes and multiple-issue story arcs. There's not really a plot pattern that the stories fall into, and all the stories are character driven. What if a pirate tried to work in an office? What if pirates got into a war with monkeys? What if pirates showed up on a talk show? There's a basic premise dropped into place and then the characters seem to be off and running on their own, like the best in improv comedy. Each situation leads to something more and more absurd, each character trying to add to the mix without taking something away from the previous character. "Open on action, end on cake" as Boyd puts it in some of his notes. "Why, it was just three months ago: we were set upon by Vikings from the future." "Monkeys. Pah! Filthy animals. The 'pigeons of the sea.' Oh, how I hate them..."
"If by 'treasure,' you mean that bag of Funnyuns, and by 'buried,' you mean you left them in planter out front, then I'm afraid some stoner kids made away with your 'booty.'" "You know, I think Anson Williams is really under-appreciated as an actor." "Uh, look over there! Mercantilism!" There actually aren't too many one-liners like that to work in. Much of the comedy comes from the general reaction of pirates to their situation and not in the dialogue itself. Pappy's various accounts of how he lost his hand, for example. Or the sudden appearance of Rod Stewart carrying around Dr. Theopolis from the 1970's Buck Rogers TV show. Or Blackbeard learning about his own history from a fourth-grade girl's crayon-illustrated school report. There's lots to laugh at in this book and, as I said, I wish I could've seen it earlier and lent some more support to it. Still, my LCS ordered it for me directly from Diamond, so it shouldn't be too hard to come by if you just ask your local retailer. So what are you waiting for, already? 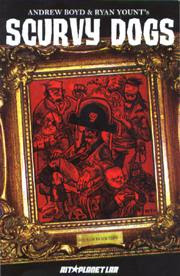 Call up your local comic shop and ask them to order you a copy of Scurvy Dogs from AIT/PlanetLar!